After 4 hours of the stunning Li River cruise, our boat arrived at Yangshuo. From the pier, we bought tickets to sit the tourist taxi ride to a bus station to meet up with our tour guide. However, before we board the taxi, Jam came up with a brilliant idea. I think I have not mentioned about this before, and I am not too sure if I should mention it now, but what the heck! You see, we have not paid our tour agent for the Li River Cruise yet. The tour package actually covers the Li River Cruise, tour guide to five popular tourist attractions in Yangshuo and the famous Impression Liu San Jie show. Jam devilishly suggested that we abscond with the money and not pay them. I was excited with the idea. Why not? It would be fun! Haha! For one thing, we did not tell them where we would be staying in Yangshuo. How would they find us? Secondly, they did not have our contact numbers how would they even begin to track us down? If there is anyone to blame for this, they should blame themselves for their gross inefficiency. I could not help smiling (in an evil manner) thinking how we Malaysians managed to outsmart the cunning Chinese people! Muahaha! And then it hit me. And it really hit me hard! Outsmart them? Who am I kidding? We had brought all our luggage from Guilin to check in at a backpackers' hostel in Yangshuo. And guess where were our luggage? They were nicely placed in the tour bus that brought us to Mo Pang Pier for our Li River Cruise. Our luggage were in the hands of the tour company! So much for running away! Looked like we were not even in the same league as the Chinese as far as playing cunning was concerned. Haha! But wait, let me assure you that this story does not end here. They are not the winner and we are not the losers ... yet. More interesting developments will be revealed in future posts, so stick around to find out how the story goes, yes? So with our "absconding" plan down the drain, we took the taxi ride to the bus station where our tour bus (and our luggage!) would be waiting for us. The above is the view I took as I was riding on the taxi. Yes, it's no ordinary taxi as we were facing the back, not the front. And that's a similar taxi you see on the photo. This is the interior of the taxi. Everyone was sitting facing the front except us in the last row which faced the back. Oh, by the way, the taxi trip costs us 10 yuan per person. Once we reached the bus station, we searched for our tour bus. Finding it, we went up the bus only to be told by the tour guide that the plan had changed and we were not visiting the five popular tourist attractions as agreed earlier. I think we were really pissed off! How could they do that? Changing the itinerary to suit themselves? That's it! We would just take our luggage and leave! As for paying for the tour package, they could just forget it! We were about to get our luggage when they made an abrupt U turn. We would now be going to the five tourists attractions as planned. Well, they should have stuck to the earlier plan but I was glad it was resolved. Our first tourist spot was the Jian Shan Temple. 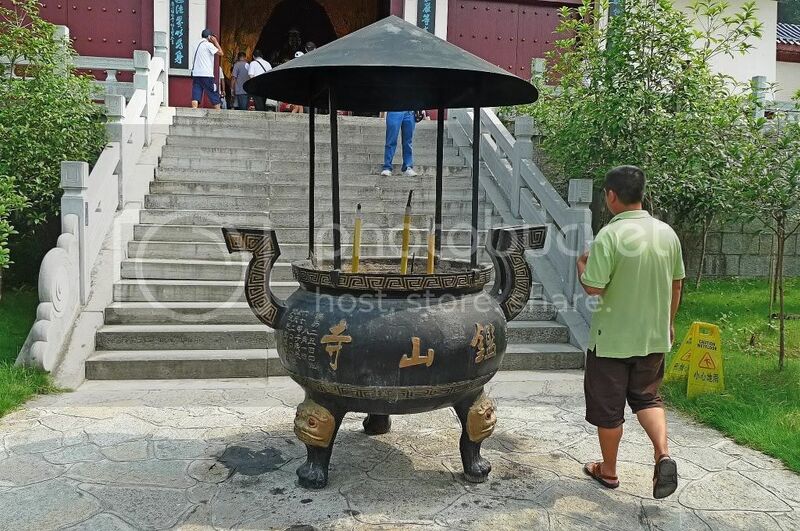 See anything funny with the above photo I captured at the Jian Shan Temple? There is a person in blue pants on the stairs - he looks like he's wearing a huge black hat! Haha! Seeing that this post is already too long, I shall reserve blogging about the Jian Shan Temple for my next post, so stay tuned! btw, how come yr luggage were in their hands?? It will be risky too to be away from your tour group so it was a tough choice to leave or not to. Good thing they resolved the tour issues. isey.. cannot outsmart them la, foong.. they r in this kind of biz, mana boleh kita lari? hahaa.. i have heard ppl advising us before going to china, be more alert esp when it comes to money too.. they are smart and shrewd at the same time..
anyway, thanks for sharing this piece of info, at least i can keep that in mind when i go next time..
Aaah.. Just when you think yo ucan outsmart them.. heheh! Well, don't ever leave your personal belongings with other people. You never know what will happen. Not paying the tour company? C'mon, don't tarnish the image of Malaysia. And more importantly, do not hurt the feeling of Chinese. You can file complaint or write to China's newspaper, but payment must be made. foong so evil thinking of not paying! Hi FoongPC, were you there with a tour the whole way through? I thought you were there to look-see with your friends alone, no tour guide whatsoever. b careful, my Chinese tourist guide didn't keep up to her promise..the cd that we bought only contained 2 days tour video instead of 4 days..cheated..
Good that you still got to see the five attractions as scheduled earlier. As a tourist, I sure would hate it if the itinerary is changed. Best not to do anything funny in a foreign land. Actually, I got 1 question to ask.. which is obviously not related to this post one..
No good to con people ma even though they're crappy. Hahaha Tell the rest of the story quick! Wow..you guys so brave to want to try abscond with the tour money. Better don't play play with Chinese tour operators. They might rough up you guys. I heard tour operators in Vietnam are not reliable. Dat's why I don bother with all these tour agencies...if we book through one oso, we'd take the light n easy booking so not tied down to their agenda, which sometimes doesn't go acc to plan! Wahhhhh naughty la u wan to cabut and skip the payment hahahha! Ehhh free and easy I meant hahaha! Ohhh i didn't perasan the guy wearing the"huge hat" la until u mentioned it...so funny and cute LOL!!! That's what those baddies would say to you when you confront them.... and they will say it with a smug look on their faces. Wow...the taxi really looked weird Foong! Hmm...it looked like a golf cart? Ha :D Is it safe? LOL! I showed B the funny pic and he oso LOL @ the man in the big hat! The con part is indeed one of the highlights of our Guilin tour. I shall let you reveal the development of this whole thing in your upcoming posts! i dunno why, each time i am in china, sure kena con one way or the other. paling sure fire way to con is the loose change. always short one! when we find out, they'll just say they counted wrongly! blek..
hmm, i agree... they should stick to the plan and cancel at the very last minute like that is a heartache. i can't ride a taxi facing the back! it will give me great headache right away LOL. is it as crazy as tut tut in Thai? write about what happen after that asap ok? Wei-wei, have you gone to China again? Quick, we are all set for the next installment..
Yah, what happened? Where's the next post? 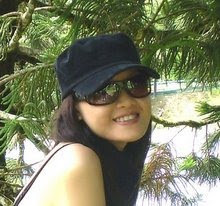 monica, how were you conned by your tourist guide in Guangzhou? 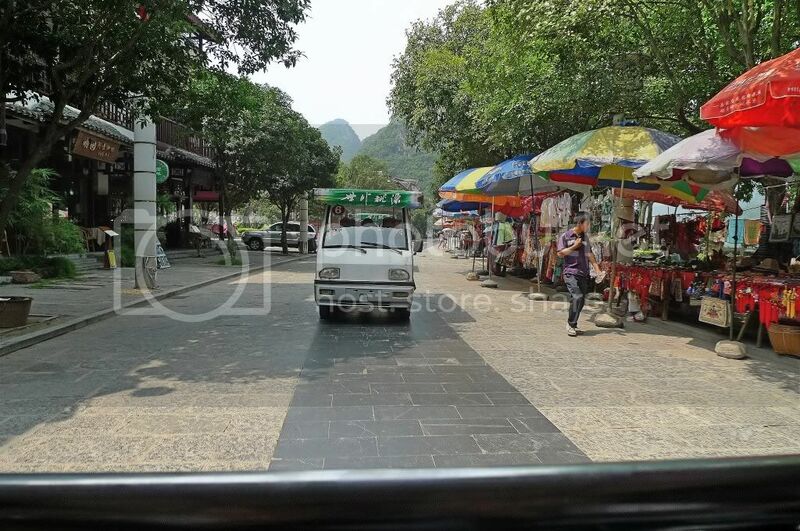 We left our luggage in the tour bus as we need to board the boat for the Li River Cruise and then return to the tour bus in Yangshuo after the cruise. We brought our luggage along because we need to check in to a hostel in Yangshuo. ayie, it's not risky to be away from our tour group as we can always go on our own. We signed up for this tour package as it is more convenient and cheaper than if we visit all those places on our own. Wow !... just like a "007 adventure" in China... excitement with the suspenion... haha... Can I be the actor in the action? manglish, I am thankful we came back in one piece. Haha! khengsiong, thanks for the advice but that's too late now. Hehe. Why you can't see the photos? lina, eh where got evil? It's the tour company that is evil and we are just responding in the appropriate way. Oh, you also kena con? Ya lah, the tour agent earn commission - that's why I dislike following tour. Our 10 days in China is all on our own, except for this Li River Cruise and Yangshuo tourist attractions - we decided to sign up for the tour package as it's more convenient and cheaper than to visit these places on our own. ai shiang, yes we were on our own without any tour guide except for this Li River Cruise and Yangshuo tourist attractions - we found it more convenient and cheaper to go for the tour package. wenn, lots of stories abound on dishonest travel/tour agents! happysurfer, yeah glad it was finally resolved and we got to see the 5 attractions. We didn't do anything funny in a foreign land, we just did not want to pay the tour company! Haha! SK, yeah they have lots of experience, but don't underestimate us 3 musketers! LOL! The blue pants guy with big hat is definitely not me. I was taking the photo, how could it be me? haha! mei teng, brave? OK, I will take that as a compliment. Haha! johnny ong, thanks for the support! haha! mariuca, it's nice to be naughty once in a while especially while on holidays! Haha! Lite and easy? Hahaha! Can't stop laughing lah! Free and easy becomes lite and easy? Listen to too much radio is it? LOL! I also don't like to follow tour. They always plan according to their own convenience and benefits. We as customers always get shortchanged. Funny right the man in blue pants wearing a huge black hat? Glad B found it funny too! Haha! eastcoastlife, thanks for the advice! But it's too late now! Haha! 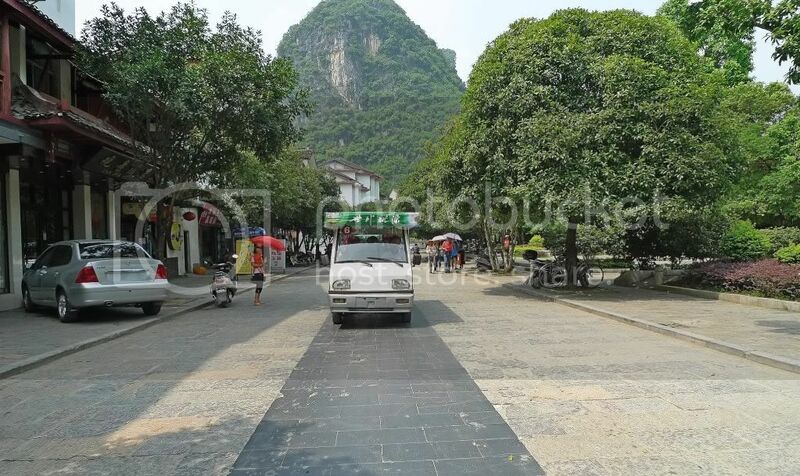 I think that type of taxi can only be found transporting passengers from the Yangshuo pier to the bus station. I also never see such taxis in any other places we visited. tekkaus, you would do like us too? OK, you've passed our test and you can join us for our next travel! Haha! I'm sure the tour company had lots of experience and it would be impossible for us to outsmart them. Then again, maybe not...haha! merryn, luckily so far I did not experience people in China cheating me on the loose change. Or maybe I didn't count properly! Kena cheated also don't know! Haha! faisal, why would riding the taxi facing backwards give you a headache? You must always face the front? Luckily I don't have this problem! Won't want a headache during my travels! 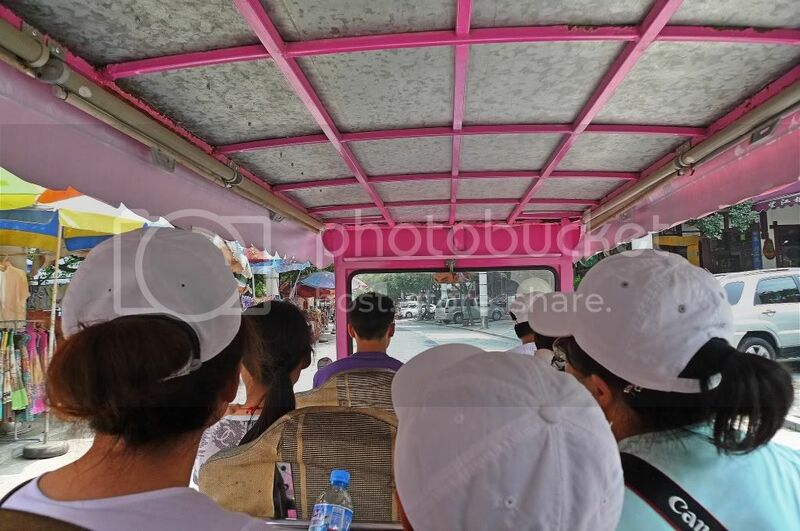 The taxi driver drives "nicely" and does not speed like those Bangkok 'tuk tuk' drivers, so it was not that fun! Haha! and the last pic.. a chicken? lol..
kenwooi, what chicken? Where? I see no chicken! Far worse chanigng the itinerary without telling you people! And everyone was expecting to see those attractions! One of their gimmicks to earn more money? michi, ooh really? The Thailand's tok tok all made in China? Interesting! Well, the difference is the driver. The driver for this taxi drives in a sane, human way. The tok tok driver in Thailand drives like mad man! LOL! :O not visiting the 5 famous in the place and bring u to visit this temple? lol sien lo liddis?